Say Goodbye To Separate Silos. Welcome To Unified Transaction Logic. Catapult transcends Omni-Channel, and it’s more than a bunch of unrelated products patched together to provide “unified commerce”. 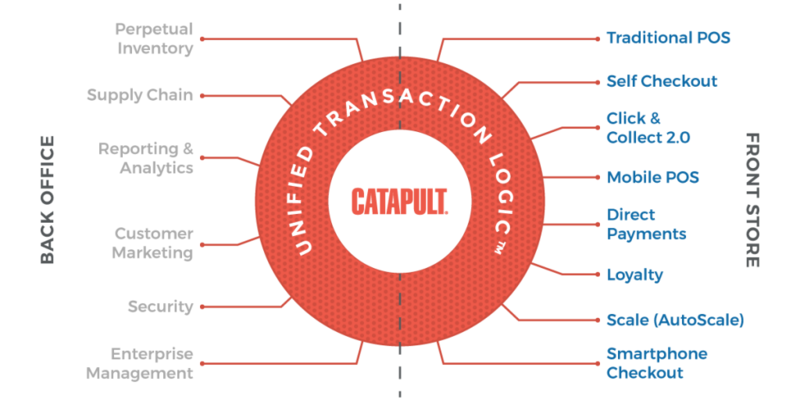 Unified Transaction Logic is the philosophy of design behind the seamless Catapult Retail Enterprise Management concept. Catapult connects all the vital areas of a merchant’s business in real time, synergisng inventory and supply chain, reporting and analytics, loyalty and marketing, POS, and payments so that they all work intelligently together. Point of sale lanes, self-checkout terminals, deli scales, pharmacy, online orders, and even smartphone apps all work as one. Catapult cuts costs and eliminates the points of failure commonly found on pieced-together systems. Say goodbye to separate silos and say hello to the future of retail. For retail enterprise executives, being able to centrally execute tasks across all store locations is imperative. The momentum of globalization has created a hyper-competitive retail marketplace where only the efficient survive. Whether your retail chain has three stores or three hundred stores, Catapult will help you reduce overhead and operational complexity. Catapult Multi-store Demand Fulfillment (MDF) is designed to optimize your inventory based on real customer demand, synchronizing processes, and streamlining tasks across your enterprise. Out of the box, Catapult comes plug-and-play ready to bi-directionally synchronize data across your retail enterprise. Transactional data, point of sale and self checkout configuration, pricing, and promotions all automatically synchronize between headquarters, stores, and warehouses. Catapult will take charge of moving data where and when it needs to move. MDF’s powerful Situational Awareness provides order and control for all parties involved in supply chain processes. Buyers see not only what each store is requesting, but also have objectively-calculated forecast data for each item by store at their fingertips. In just a few clicks pull up critical supply data including historical data, on-hand quantities at each store, warehouse inventories, and delivery truck data. Store managers can follow requests through all points of the fulfillment process, as well as view and prepare for pending deliveries of items pushed down from buyers. In conjunction with the ECRS Gateway™ Service, MDF notifies buyers and/or store management when vendor orders have been accepted and shipped. 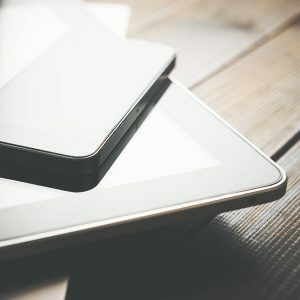 Using ECRS Gateway, you’ll have bi-directional electronic communication between your stores and your suppliers, moving items through the supply chain becomes precise and efficient. With real-time information, your warehouse will be ready to receive and pick items the moment they arrive, keeping store shipment tasks running smoothly. Communicate directly with vendors via bi-directional EDI protocol to facilitate POs, Invoicing, PO/Shipping Acknowledgements, Vendor Catalog Updates, and Promotions. MDF also accommodates de-centralized POs for Direct Store Delivery (DSD). This allows the warehouse step to be by-passed for specific orders, saving significant time, labor, and expense. Say goodbye to costly overstock scenarios and keep closer track of your items. 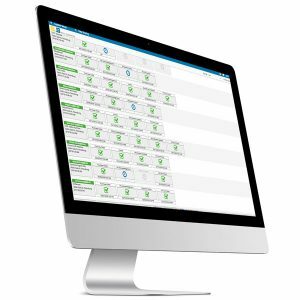 A demand fulfillment solution is only as good as its ability to keep track of your stock and to generate optimized picking routes. ECRS’ MDF facilitates a simple, but powerful warehouse environment designed for heavy lifters, not IT staff. When a store delivery worksheet is ready to be fulfilled, MDF automatically generates a bin/shelf picking sequence outlining the quickest route for processing the order. Reporting and analytical tools found in Catapult will optimize your decision-making process so you can be certain about the roads your enterprise chooses to travel on the journey to success. Catapult offers more than 300 reports that enable executives to access business intelligence about store performance. Reports are established from best practices and user requests. Each report can be filtered by a multitude of data dimensions. Briefcase™ – OLAP Cube is a high speed decision support system that can quickly provide insight into the whos, whats, whens, wheres, and whys behind product sales, profit margins, customer habits, store performance, supplier performance, and employee efficiency.